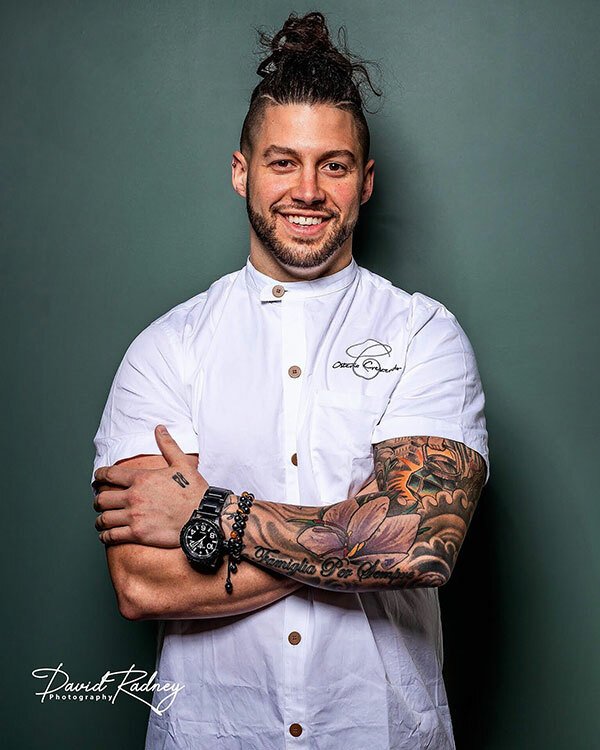 Robbie Felice’s journey started in high school when he was accepted into the Culinary Institute of America in Hyde Park, New York. For his externship, Robbie accepted a position with Mario Batali at his flagship restaurant Babbo in New York City. During his time at Babbo, he learned and worked under Chef Frank Langello, who became a culinary mentor. After graduating from culinary school, Robbie worked at two upscale New Jersey establishments, Highlawn Pavilion and The Manor. In 2011 Robbie relocated to Vail, Colorado where he spent eight months honing his skills working under various chefs. He then moved to Las Vegas, Nevada and rejoined the Batali Bastianich Hospitality Group at B&B Ristorante and worked under Chef Matthew Harbin and alongside culinary director Jason Neve where he was promoted to sous chef while running the salume program. In 2015, Robbie embarked on a trip to Europe to expand his culinary knowledge. Staring in Holland, Robbie staged with Sergio Herman at his one Michelin star restaurant, Pure C—an experience that put the culinary industry into a whole new perspective for him. Robbie then received an offer to go to Antwerp, Belgium and stage at Herman’s newest restaurant, The Jane, where he had the life-changing experience of working directly under Chef Sergio Herman and Chef Nick Bril. From there he traveled to the Netherlands, London, Italy and Spain, where he was exposed to various cultures and cuisines, refining his technique along that would forge his own signature style. Robbie landed back New York City in 2015 joining the two Michelin star restaurant, The Modern. He spent the next four months learning and drawing inspiration from Chef Tom Allen and Chef Abram Bissell. Following his time at The Modern, he joined his long-time culinary mentor, Chef Ryan DePersio at Fascino in Montclair, New Jersey. In 2016, Robbie and his father, Joe Felice decided to open their own restaurant, birthing Viaggio Ristorante in Wayne, New Jersey. In his pursuit of authenticity, Robbie unveiled a restaurant true to his cooking philosophy— locally sourced ingredients used to create traditional Italian fare with a modern touch. In 2019, Robbie and Joe introduced Osteria Crescendo in downtown Westwood, New Jersey. Staying true to the farm to table principles of Viaggio, Osteria Crescendo has its own unique flare offering large scale ‘for the table’ dining and Italian ‘street fare’ at the bar. Originally from Wayne, New Jersey, Joe Felice has owned celebrated restaurants since the age of twenty-two. In 1992, he opened his first establishment, The Gourmet Café in Parsippany, New Jersey, which delivered savory and creative Italian cuisine for fifteen years and is still very successful under new ownership. From 2005 to 2009 he owned Casa Di Amici in Denville, NJ where he provided customers with the same high-quality food and service. In 2016, Joe embarked on a new adventure and opened Viaggio Ristorante in his hometown of Wayne, New Jersey with his son Chef Robbie Felice. In 2017 Viaggio was nominated as one of New Jersey’s “Best New Restaurants” and in 2018, ranked among “New Jersey’s 30 Best Restaurants.” In 2019, Felice was proud to open a second restaurant with his son, Osteria Crescendo, in Westwood, New Jersey. Tommy Voter began his career in Las Vegas working for Block 16 Hospitality. During his time there, he worked both behind the bar and as a server at their modern, brick oven pizza restaurant, Flour & Barley. Following a passion for craft beer, Tommy went on to complete the first level of the Cicerone program which certifies and educates beer professionals to elevate the beer experience for consumers. A trip back home to New Jersey in 2016 brought Tommy to Viaggio, Robbie Felice’s flagship restaurant, on opening night and shortly after, he joined the team as a server. In 2018 Tommy became General Manager of Viaggio. Tommy was appointed Director of Operations at Viaggio and Osteria Crescendo in 2019 with the opening of Felice’s second restaurant. Tommy’s passion for hospitality complements Felice’s talents bringing an exceptional dining experience to guests. Angie Segura’s passion for the industry began in high school. After working with a family caterer, she followed her interest and attended The Culinary Institute of America. During her time at CIA, she landed an externship for one of Tom Collichio’s NYC restaurants. Upon graduating, Angie focused on restaurant service with the goal of restaurant management. To pursue her dream, Angie was selected as part of the opening staff at top New Jersey restaurant, Common Lot in Millburn, where she quickly became captain within a year. In 2017, Angie joined the Viaggio staff as a server and earned the assistant manager title in 2018. Today, Angie is the Dining Manager at Osteria Crescendo responsible for an elevated customer dining experience. Joshua Strauss spent ten years in the Special Education field, followed by a sabbatical as a traveling musician before finding his passion behind the bar. Joshua began his bar management career at Cowan’s Public in Nutley, New Jersey. He then went on to develop beverage programs at The Cassidy in Maplewood, New Jersey and Ani Ramen House in Jersey City, New Jersey where he embraced the opportunity to train with award-winning NYC-based bartender, Kenta Goto. As Beverage Director, Joshua has applied his knowledge of classic and contemporary cocktails to introduce a creative and unique Italian-inspired beverage program at Osteria Crescendo.